I feel cake is an essential all year round but now it's getting chilly and dark again it's back to being one of my five a day again. I came across some recipes from Lorraine Pasacle's new book, 'Guilt-free cakes and bakes' in a supplement last weekend and have been thinking about them ever since. I do get a bit stuck in my ways when it comes to cooking - I've been making the same 'rich moist chocolate' number for the last fifteen years - convinced there can be no better. So baking outside the box this weekend was quite a step. I went for Lorraine's carrot and apple cake- first name terms; she's from my local town so feel we could actually be friends - and it was seriously delicious. I followed her recipe to the letter, she says even a slight bit of wandering off piste could end in disaster and it was worth it. Not only was it better than I hoped for, it's also a diet cake which obviously means you can eat twice as much. Carrot cakes are often more healthy than regular cakes due to things like the addition of, er, carrots! They also often include other fruit and use oil rather than butter, which cuts the saturated fats, etc. So the task with this recipe was just to gently reduce the sugar and try and reduce the oil, while still ensuring that the cake is as tasty and as yummy as ever. ● Preheat the oven to 180C (fan 160C), 350F, gas mark 4 and set the shelf in the middle. Grease two 20cm (8in) sandwich cake tins with a light spray of oil, line the bottoms with discs of baking parchment and set them on a baking sheet. are baked, remove from the oven and leave to cool in the tins. ● Next, to make the frosting put the cream cheese, icing sugar, crème fraîche and vanilla seeds or extract into a medium bowl and mix together until smooth and well combined. Then cover and pop into the fridge to firm up a little while waiting for the cakes to cool. ● Once the cakes have cooled, carefully remove them from their tins. Sandwich the cakes together with half the frosting, then put the rest of the frosting on top. 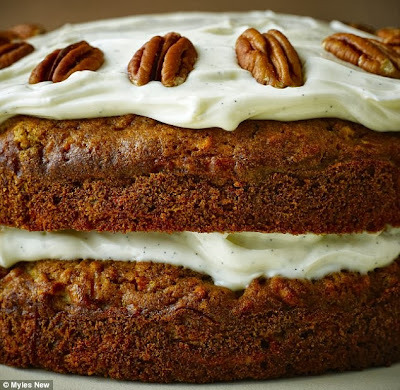 Arrange the pecans around the outer edge of the top frosting and serve.